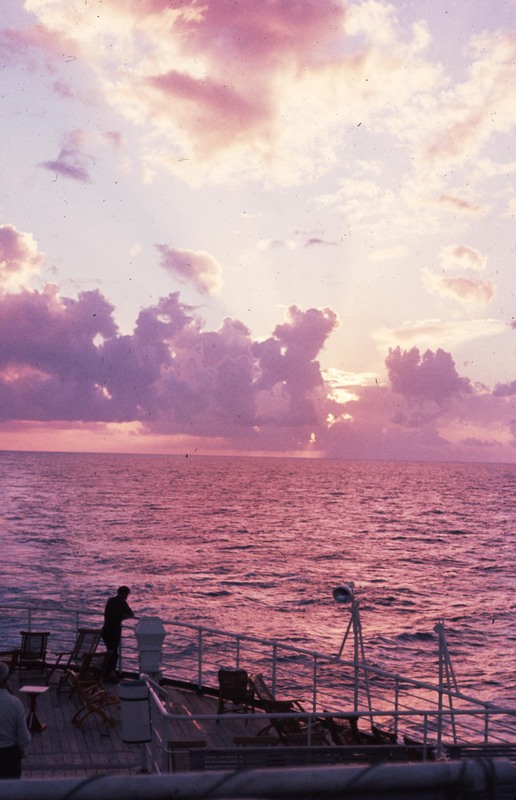 “This shipboard life is curiously hypnotic,” I wrote to my parents a few days out from Wellington in February of 1962. “Absolutely nothing to do all day but sit & watch the waves go by. 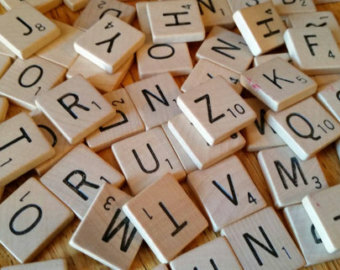 You soon find it practically impossible to do any thing else.” The ‘what else’ we found as we sailed for two weeks across the tropical Pacific was the game of Scrabble. Every afternoon we gathered on the deck with a group of shipmates, one of whom had a Scrabble game in her luggage. While the nautical miles accumulated, we bonded over the game, and have continued to stay in touch with some of them over the many years since. After the storms and seasickness of the first week, we had perfect weather: sunny days, calm seas, and just enough breeze to keep things cool. 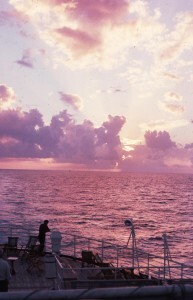 I decided that ocean voyages were not so bad after all. I had time to dream. 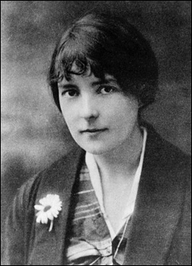 When my husband Tony and I carried our bags up the gangplank of the “Johan van Oldenbarnevelt” earlier that month, bound for New York and then England, I felt I was walking in the steps of my role model, the great New Zealand writer Katherine Mansfield, who also went abroad at a young age to pursue a literary career. A few highlights of the voyage float into my mind. A visit to the bridge, where I was allowed to steer the ship. Watching flying fish and dolphins leap out of the water close to the ship. The obligatory visit from King Neptune the day we crossed the equator. 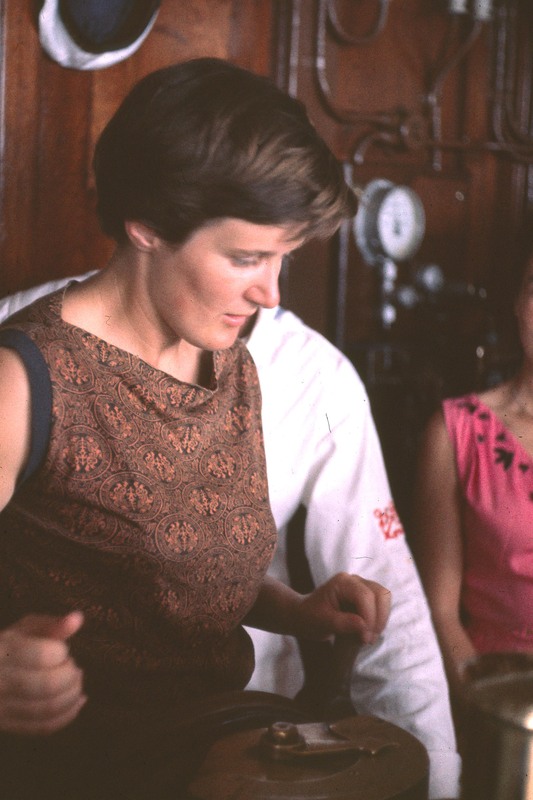 But mostly I remember playing Scrabble on deck with our new friends, while Indonesian stewards in white jackets rattled tea-trolleys. 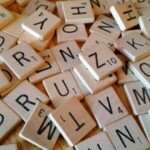 I haven’t played Scrabble in years, and don’t remember what happened to our old game set. But this week we bought ourselves a new one. Nostalgia filled my heart as I pulled out from the bag a handful of little wooden tiles. JVO photographs are by Tony Eppstein. Maureen is exploring the contents of an old black filing cabinet, which contains 55 years of letters, notes and memorabilia. 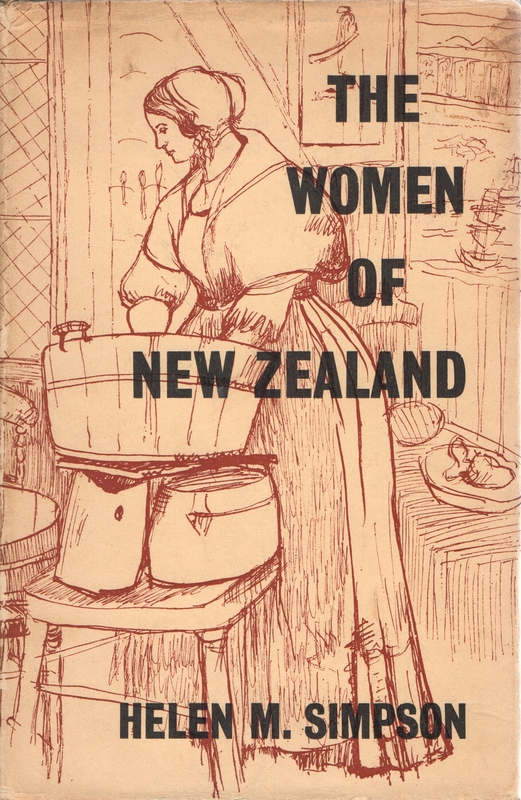 The book I referred to, The Women of New Zealand by Helen M. Simpson, had been a parting gift from my parents, who had come to Wellington to see us off. 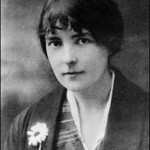 First published in 1940, it was a vivid description of the lives of pioneer women. The Ship “Kenilworth” Outward Bound for New Zealand. 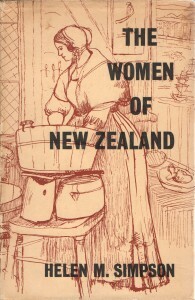 An illustration in Helen M. Simpson’s The Women of New Zealand, it is a reproduction of a painting by J.C. Richmond, now in the possession of the National Art Gallery, Wellington. Our quarters on the JVO were certainly cramped. Our lower-deck cabin had two bunks and a tiny washbasin in a space so narrow we had to take turns getting dressed. 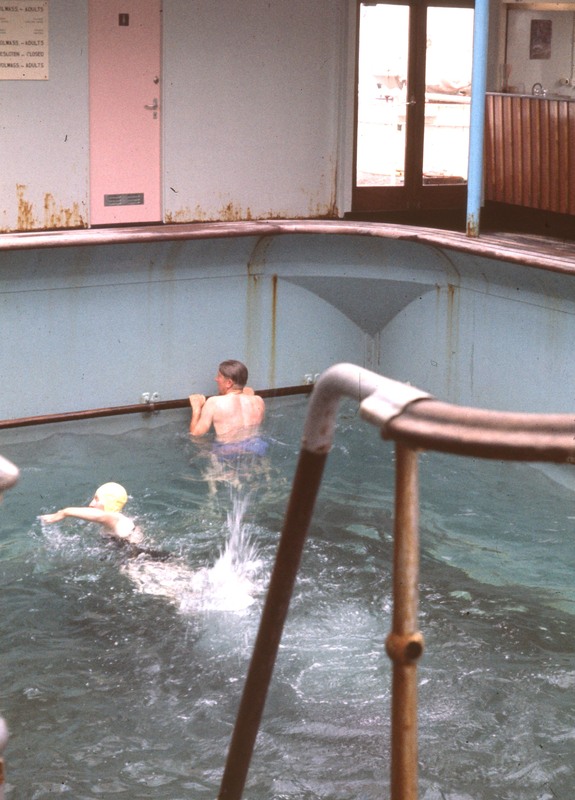 Outside in the corridor, the airless heat was rank with smells from the nearby galley. But unlike those early emigrants, we didn’t have to cook for ourselves, or bring along our own cabin furnishings. 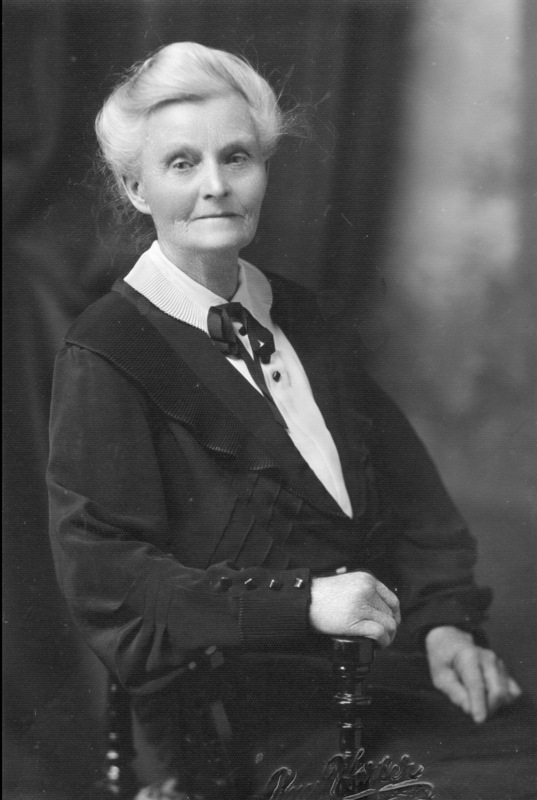 Great-grandma Sarah Jane Caundle, whose parents emigrated to New Zealand in 1862. Granddad Charles Dinsdale, who emigrated from Yorkshire to New Zealand in the early 1900s. I think of my own ancestors who braved the outward journey. A hundred years before Tony and I walked up the JVO’s gangplank, my newly-married great-great grandparents, Bernard and Sarah Donnelly, set out from County Leitrim in Ireland to join hundreds of other Irish immigrants on the New Zealand goldfields. 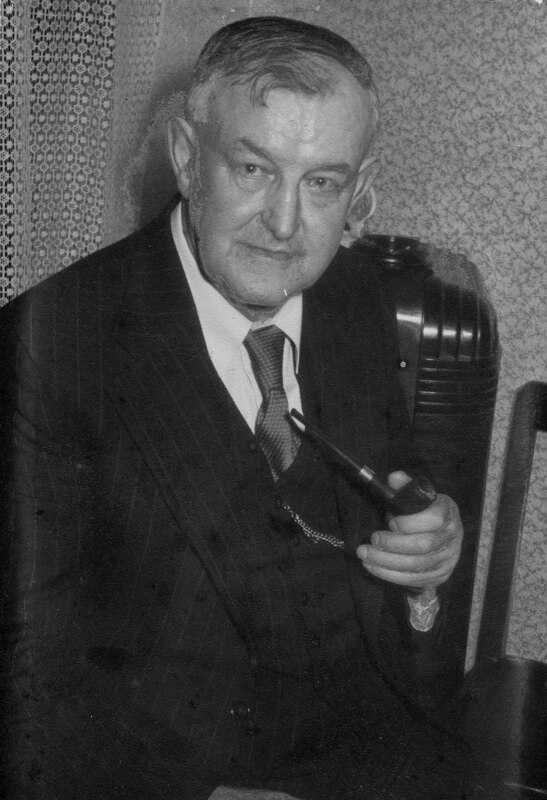 My paternal grandfather, Charles Dinsdale, emigrated from Yorkshire, England in the early 1900s. 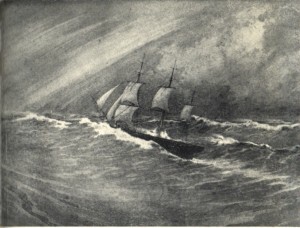 By then steam had replaced sail, but he would have set out for his new life half-way across the world with the same sense of adventure. Simpson’s standard of appropriate behavior is typical of the New Zealand society I grew up in, where we were expected to just deal with whatever hardships came our way. This is why I felt so chagrined for feeling sorry for myself. Maureen is exploring the contents of an old black filing cabinet in her attic, which contains 55 years of her writing notes and memorabilia. 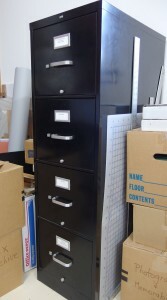 An old black metal filing cabinet sits in my cluttered attic. 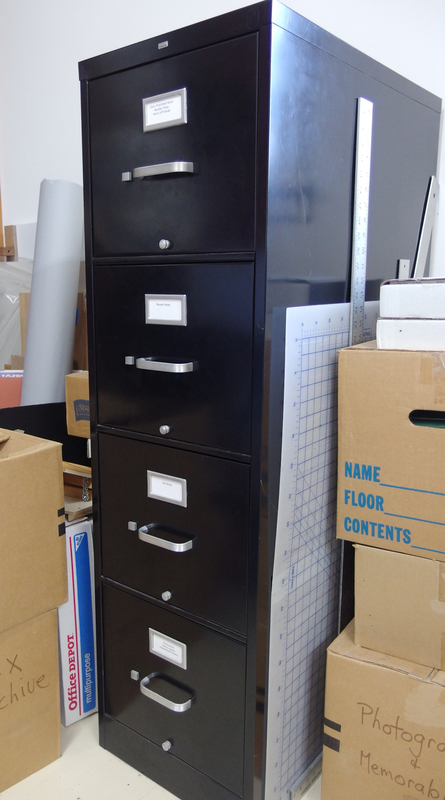 Stuffed into its four drawers are fifty-five years of my stories, some published, most not. Sooner or later someone will have to dispose of all the dog-eared pages and travel-worn manuscript boxes. In the meantime, I’ve set myself a little project for this blog: go through the files and find pieces of my past that you, my readers, might find interesting. I had a pleasant conversation with Russell Clark, the sculptor, who was making the sculpture free of charge as his tribute to Opo. It is of Hinuera stone, which is buff colored and coarse in texture. The sculpture was indeed nearly finished, and would be shipped to Opononi the following week. I was so proud when my little story appeared exactly as written, along with a nice photograph, in the next morning’s edition, having survived unscathed the eagle eyes of The Press’s copy editors, gruff eminences who ruled from a curved dais in back of the press room. 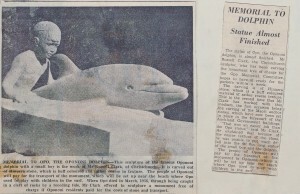 I did not meet Opo, but have my own dolphin memory. We were returning from a family vacation on Tuhua, an island offshore from Tauranga. The day was brilliantly sunny, the launch was bouncing through waves, and I had just learned that I’d been awarded a national scholarship to attend university. A school of dolphins surrounded the boat. Leaping joyously through the waves, they escorted us back to land. As I stood at the bow, I felt like a princess. A king tide this morning, and we’d heard that it would be useful for people to document how high the water came, so that we’d have some idea what to expect as climate change brings rises in sea level. An excellent excuse to amble down to Big River Beach in Mendocino with my new camera and practice getting my horizons horizontal. We’ve had no major rainstorms yet this winter to wash out the sandbar that builds up at the mouth of the river. From a vantage point on the cliff, we watched the tide creep over the bar, then took the old steps down to the beach to check on the tide height at the bridge. Yes, the water was high, too high to walk on sand and touch the bridge pier, as we can usually do. 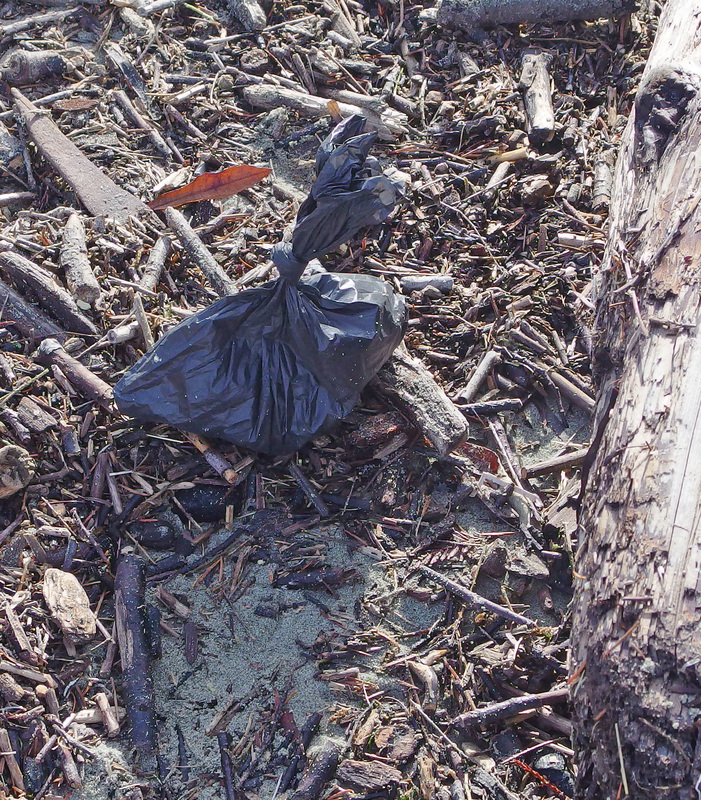 Strolling back along the tide line, we were enjoying the peace and quiet beauty of the scene when I noticed something that set my teeth on edge: a plastic dog poop bag discarded by a driftwood log. I’ve seen such offerings frequently around this region: beside a signpost, on the edge of a trail. I want to shake the humans who leave them, who are so unclear on the concept of citizenship they have no thought for the environmental mess they are causing. It’s no wonder the sea level is rising. 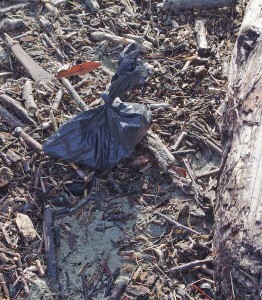 I think of this oddly moving little story every time I walk on Ten Mile Beach, as I did last Sunday. The receding waves left undulating lines of bubbles, iridescent in the hazy sunlight, that popped to form patterns of foam. Scattered across the beach were strands of bull kelp, dried into coils and loops that lay like a cursive script on the sand. that could have been words, but were not. 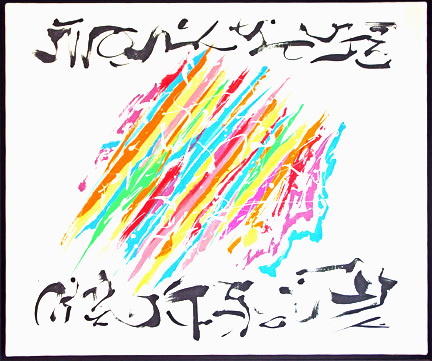 the hand of an old man painting messages of love. On my way downstairs from Jim’s studio, I fell in love with one of his paintings, which now has a place of honor in my house. I smile when I read its message. I’m jealous of Scottish visual poet Ian Hamilton Finlay. 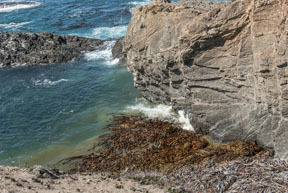 Last Sunday morning I walked on the cliffs at Chapman Point, just south of Mendocino. Tony, who does the graphics for Mendocino Coast Writers Conference, was taking photographs that might become next year’s program cover or a display ad in Poets & Writers magazine . I contemplated spume lifting from waves as they rolled in steady rhythm against the rocks, and thought about words I might use to convey the sense of transience that pervades this dramatic boundary between earth and sea. I opened an example at random. Immediately my entire afternoon at my desk was washed out to sea. Before me was Ian Hamilton Finlay’s “Wave/Rock” from Aspen #7. Just two words repeated: the brown rockrockrock stacked on top of each other so that the near-vertical strata are visible; the blue wave words spread and broken as they crash against the rocks. I had no need to write my poem. I looked instead at Tony’s images of waves and rocks. High tide was at dawn. 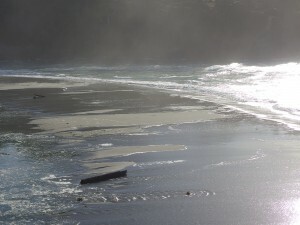 By noon, the breaking waves are far distant, and the creek on its way to the sea has cut a miniature cliff through damp sand. A reflection of sun on water ripples along the vertical face, fluted already by tiny sand-falls. As I watch, more sand avalanches skitter down to where, about half-way to the water, an undulating line with a little thickness to it, like a welted trim, defines where the vertical cliff gives way to a more gradual slope. The damp sand grains bounce off the ridged line and spread out down-slope, coming to rest at about forty degrees, their angle of repose. The scene is a microcosm of the world’s geological processes, the lifting up of land masses, the crumbling away. 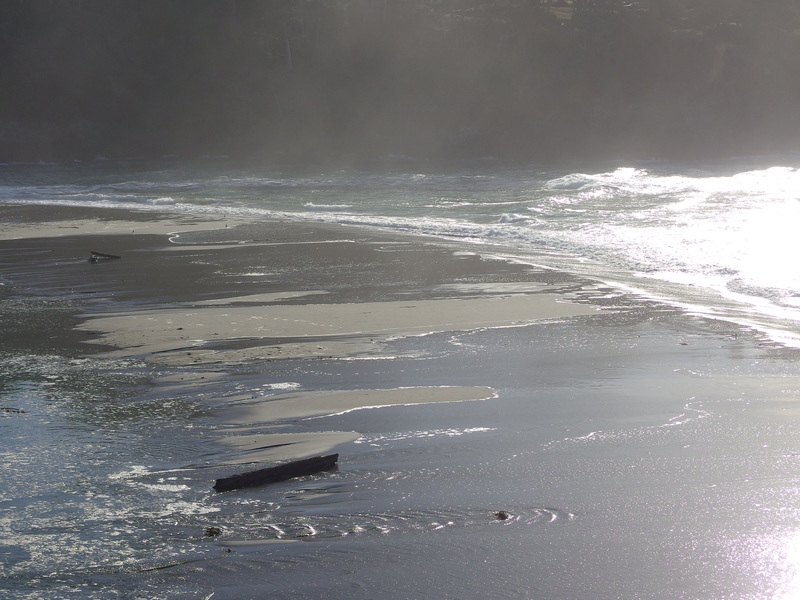 But what strikes me most is the beauty of it: the rippling light, the fluted cliff, the flurries of sand. I am mesmerized by pattern. 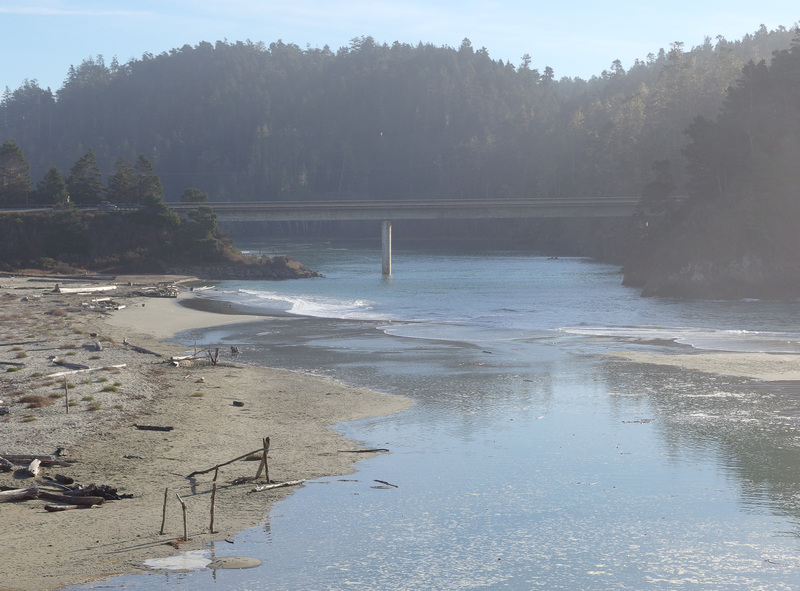 The Fort Bragg Haul Road this Saturday afternoon is like a painting of a European beach promenade. Misty silhouettes in the silvery light, family groups with dogs and bicycles take the air in the short break between storms. 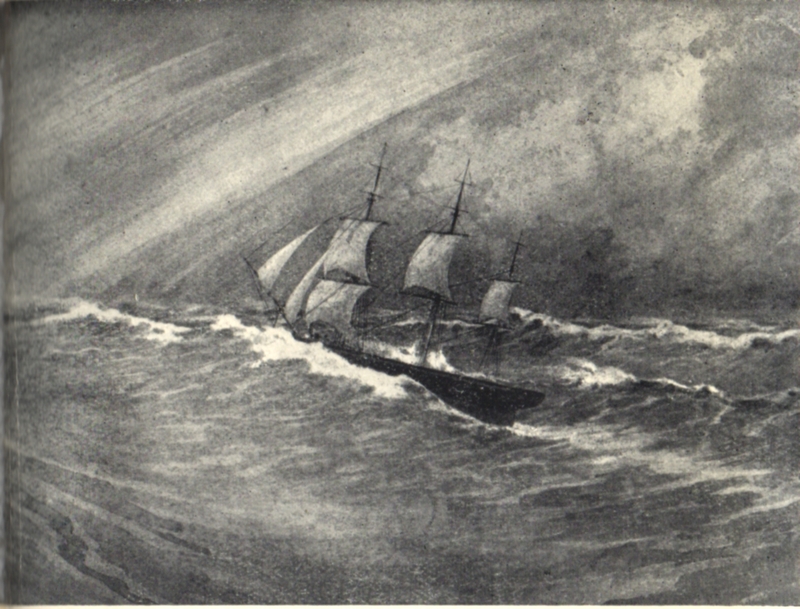 The sea roars. A brisk wind lifts delicate plumes of spray from the waves. The old Haul Road is a local treasure. 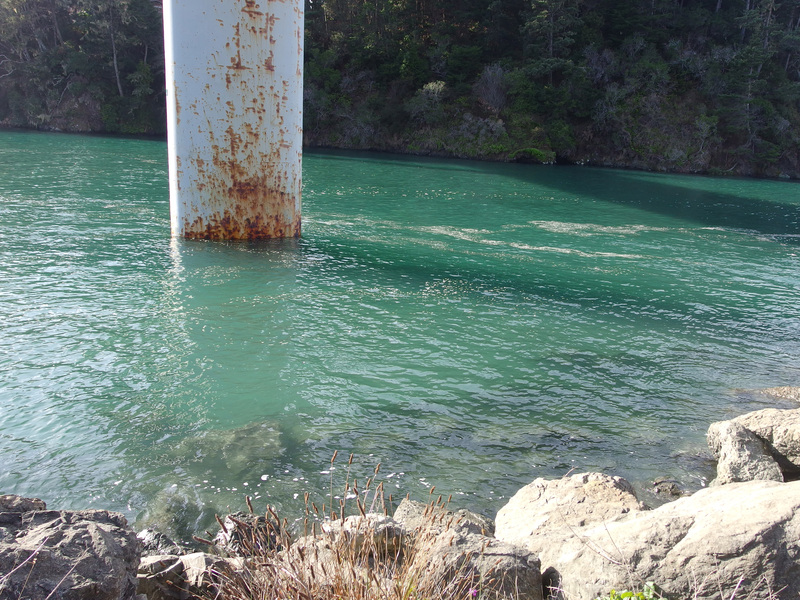 Built in the early 1900s to haul logs to the Fort Bragg lumber mill, it is now part of the California coastal trail system. Further north, the sea has washed away much of the road, but for close to three miles, between the Pudding Creek Trestle Bridge at the edge of town and the campground at MacKerricher State Park, it is still reasonably intact. This afternoon, after a week of rain, people walk with smiles on their faces. The reservoirs and aquifers are filling up, ending fears of drought. More rain is forecast. Today the sky is blue and the sea magnificent. Mid-morning the sky clears, a break between storms. Our generator rumbles. The power is out, a downed line somewhere back in the forest. So is our cable internet service. From the house we can see spume lifting high over the cliffs. Nothing for it but to go there, to walk the cliff path around the Mendocino Headlands, to exult in the roar, the tumble of white, the spritz of salt spray on our faces. At the big blowhole near Main Street, huge plumes of water rise with a satisfying ker-thump. We decide to avoid the muddy parts of the trail further on, and head up to Main Street. Nearly all the stores are closed because of the power outage. But Gallery Bookshop, on the corner of Main and Kasten, is open, though unlit. We step in to say hi. Tony finds a novel he wants, Hilary Mantel’s Wolf Hall, winner of the 2009 Man Booker Prize. At the checkstand in the center of the store we chat with Christie and two other staff members, Johanna and Jane, about this book and another we’ve been reading lately, A.S. Byatt’s The Children’s Book. I love the cosiness of these conversations about books. I love being a local in this remote and beautiful place.